Ta-da! That's the sound of our brand new kigurumi onesie animal costume, poofing into existence as if plucked from a grey-haired magician's top hat. Debbie Mcgee anybody? No thanks, we'll be OK with our new costume thanks - it's a rabbit, and it's white... 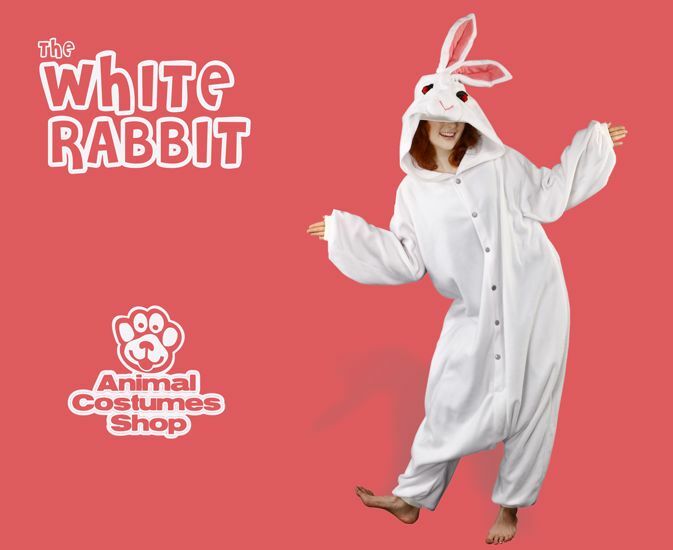 It's the White Rabbit Kigurumi Onesie Costume. Hoooyar! It's designed for adults that are between about 5'5" and 6' tall (165 - 185cm) and it's really wide across the chest so will fit most. Like all of our fleece kigurumis, it's made of a soft fleece polyester material and features some huge rabbit ears on its hood, with pink lining and some realistically red-tinted eyes. It would work great as a fancy dress rabbit costume, whether for an animal themed party, or perhaps even an Alice in Wonderland party. Alternatively, it's realistic white rabbit likeness makes it a great thing to wear whilst scaling the walls of your local pharmaceutical behemoth to make some kind of animal rights statement. If you're not into that kind of thing, don't worry - being made of a soft fleece material, it's also quite good as a super-warm pair of pyjamas.